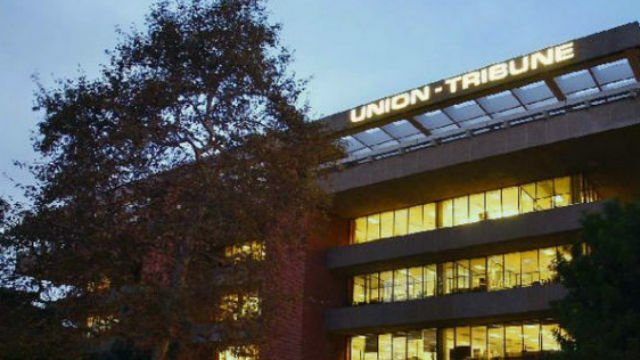 The Union-Tribune building in Mission Valley in a photo from the “About Us” page of the newspaper’s website. Jeff Light, the editor of the San Diego Union-Tribune, will now also serve as its publisher as well as part of a leadership overhaul at nine newspapers owned by Tribune Publishing Co., the Union-Tribune reported Wednesday. As publisher, Light will take over the Union-Tribune’s business operations following a reorganization by Chicago-based Tribune Publishing’s new chairman, Michael W. Ferro Jr. Tribune Publishing, which acquired the Union- Tribune last year, is combining the roles of editors and publishers at its newspapers, which include the Los Angeles Times, the Chicago Tribune, the Baltimore Sun, the Hartford Courant, the Orlando Sentinel, the South Florida Sun-Sentinel, the Morning Call in Allentown, Pennsylvania, and the Daily Press in Virginia. “By giving our newsroom leaders dual responsibilities, we are ensuring our local brands remain vital to the communities they serve with our journalists and creators producing premium, compelling content across all mediums,” Tribune CEO Justin Dearborn said in a statement. Light was vice president of interactive publishing at The Orange County Register before being hired by the San Diego Union-Tribune in 2010. He has overseen various initiatives, such as redesigns of the print and digital editions. Other changes made by the nation’s third largest publisher include promoting Los Angeles Times publisher Timothy E. Ryan to president of publishing. He is the exception to part of the restructuring in which the publishers of Tribune newspapers are leaving the company.